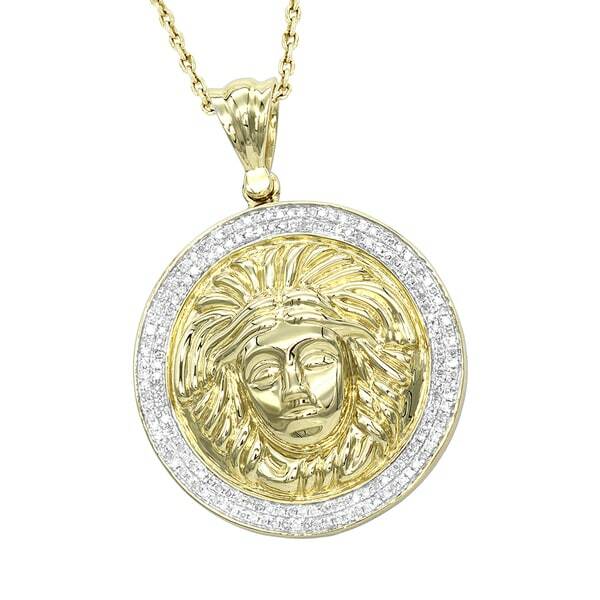 "This beautiful and affordable 10K Gold Versace Style Diamond Pendant Medusa Head Medallion by Luxurman showcases 0.5 carats of sparkling round cut white diamonds. Featuring a Versace style design this gorgeous medusa head pendant makes a great present for any occasion. All weights and measurements are approximate and may vary slightly from the listed information. *T.W. (total weight) is approximate. 1/2 carat T.W. may be 0.45 to 0.57 carat. Treatment code N. See Treatment Guide for further information. "Does chain only come in 18 inches?" Yes, that is the only size for the chain.